I’m crackled out. I’ve been crackled out for about a year. I’m bored of crackle. No more crackle. Boo to crackle. 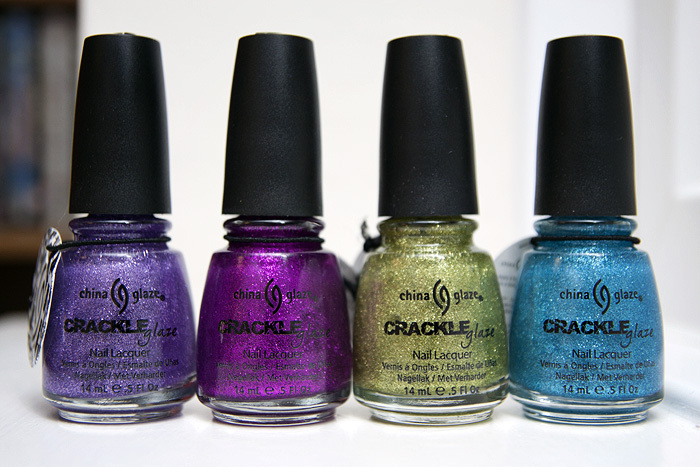 China Glaze have released FOUR new crackle glitter polishes, because they think that I OBVIOUSLY haven’t seen enough crackle yet. 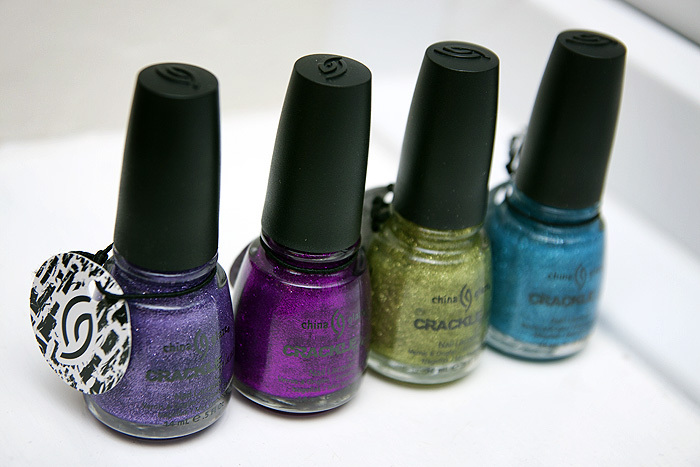 The new China Glaze Crackle Glitters* landed on my doormat yesterday and I thought I’d swatch them up for all those 3 people out there who aren’t bored of crackle polishes yet. If I’m serious for a moment, they’re actually pretty cool (in a really boring crackly way). The four shades are Summer brights and each dries to a matte finish. I haven’t applied a top coat in the swatches because all the swatches I’ve seen so far DO include a top coat and I also wanted to gauge their drying time and how much they might/might no pull apart the lower layers of my maniucre as they dried. Turns out, they didn’t fare too badly at all, each finger was touch dry in about 10 minutes and fully dry within half an hour. That’s without top coat remember. Jade-d is a beaut, it’s a golden green that really pops against a black nail. Glam-more and Gleam Me Up are equally punchy and Luminous Lavender is left languishing as my least favourite. It’s simply sheerer than the rest and lacks the spark and contrast apparent in the other shades. If you’re on a budget, it’s worth pointing out that MUA do some crackle glitters for around half the price of these, though I haven’t tried them so can’t comment on their quality. 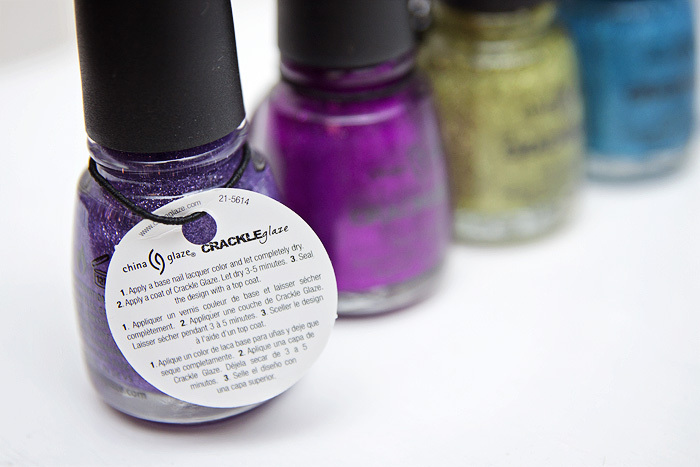 China Glaze Crackle Glitters should be available to buy in the UK instore from Sallys. I can’t see them up on radiant-babe-beauty or beauty4nails-body yet, but I’m sure it won’t be long. Are these reigniting a spark of fondness for just one more dip into the trend? I’m with you, as pretty as these are, I’m just bored with crackle. I haven’t even used all my existing crackle polishes yet. The same goes for magnetic polishes. Yawn. I’m fairly sure I saw these in Sallys about a week ago. Boots 17 also does a glitter crackle – gold glitter in a black base. It was this (which I think is a great combination and very hard to find in non-crackle format) that led me to experiment and discover that about 3 layers of glitter crackle polish with a top coat basically cancels out the crackle effect and just behaves like regular glitter. So you can use them up without looking out of date, if you so desire. Count me in the ‘bored’ sorority. 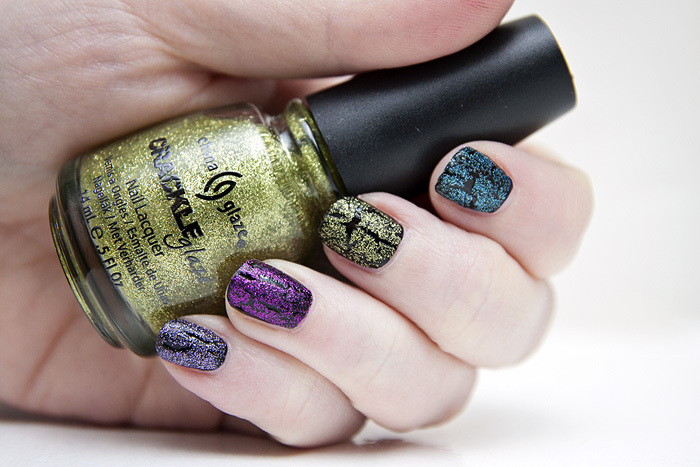 Gleam me up is really pretty but I’m really bored with crackle polishes too..
I’m with you. I’m very picky about the crackle color combinations/finishes that work for me, and these….no thanks. I’m loving the current magnetic polish trend though! I’ll definitely be wearing those for a while. Hmm. I’m not a manicure bird – haven’t got the nails for it. But I do paint my toenails and I’m wondering if for the summer some of this bright crackle would be good on toes? Or would it look like I’d stood in a puddle? I guess I’m in the minority. I like the fact that they’re bright and sparkly. They’re just in time for Summer. I think they look fabulous! I kind of dont like shatter but those glitters are GORGE.